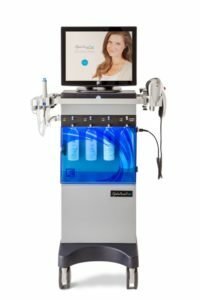 The hydrafacial treatment is a non-invasive and simple hydradermabrasion procedure that can do wonders for your skin, improving signs of aging like fine lines and wrinkles, clearing out pores, cleansing oily and acne-prone skin, and improving the appearance of hyperpigmentation or brown spots. It is the only procedure of its kind that can simultaneously cleanse, exfoliate, extract, hydrate and protect your skin all within a single sitting and without irritating your skin. Is a hydrafacial treatment right for you? The hydrafacial is the perfect all-round treatment, because it can improve a wide variety of skin issues at once. For this reason, people with almost any skin type are good candidates for this procedure, ranging across ages, ethnicities and levels of oiliness or dryness. The hydrafacial technician will begin the procedure by cleansing and exfoliating your skin using a special tool that opens up your pores and sloughs off dead skin and any remaining makeup on your face. This tool has a calming, vibrating sensation and it prepares your skin for the next step, which is the acid peel. The peel, once applied, is much gentler than most, rejuvenating your facial skin without any stinging sensation, but rather a light tingle. The next step is extraction, which is when the technician uses a tool to vacuum out any remaining dirt and oil that are clogging your pores. Finally, the last step involves using a vortex-fusion tool and infusing your skin with a special revitalizing serum that is rich in antioxidants and collagen, which will hydrate and help with the elasticity of your skin, leaving you feeling refreshed and renewed. The entire hydrafacial should only take about 45 minutes, so it’s the perfect way to give your skin a boost in the middle of the day or when you don’t have a ton of time. And since this is a non-invasive procedure, there is no downtime after you’re finished. In fact, there is no discomfort and little to no irritation associated with this procedure, so it’s easy to reapply your makeup and get back to your day immediately after the treatment is over. Any lingering pinkness should not last more than an hour, and you should start seeing positive results almost right away! This treatment is perfect to try out for a single occasion, or to refresh your skin on a monthly basis.